Integrate all your instrumentation needs seamlessly with a choice of 100+ cosmetically matched depth, speed, electrical, tankage, and engine instruments as well as electronic accessories to choose from. 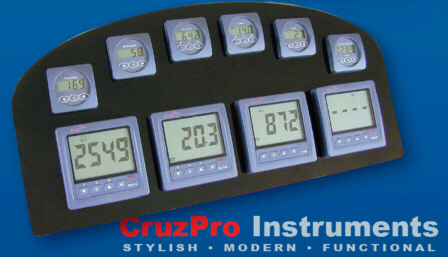 CruzPro manufactures a wide range of intelligent instruments, digital gauges, alarms and monitors designed for use in the marine and motor home/RV markets. Our product lines include engine gauges, fuel/fuel consumption and tankage gauges, electrical gauges, gas detectors, depth, speed and wind sensors and instruments, PC based Fishfinders and electronic accessories such as chain counters, NMEA combiners, digital clocks, bilge alarms, etc. These intelligent gauges either contain built-in calibration curves for all popular standard resistive senders - both European and American styles, or learn the sender characteristics. Custom 0-5V, 4-20mA and high voltage versions are also available by special order. Most CruzPro gauges work on both 12 and 24V batteries, have built-in user settable high and low alarms and output NMEA 0183 serial data to aid remote monitoring or logging of performance data. Most CruzPro gauges are CE certified and most products are RoHS compliant (environmentally friendly and lead free). All products enjoy a full twelve (12) month parts and workmanship warranty. We ship worldwide to areas not served by a local dealer and OEM inquiries are welcomed. Compare our product performance specifications. *** NEW 31 March 2016 Click here *** PR60 digital pressure gauge/w Hi/Lo alarms & NMEA 0183/external alarm output. *** NEW 9 September 2015 Click here *** UWSD10 3D Ultrasonic Wind Sensor Windows configuration software. *** NEW 27 May 2015 Click here *** UWSD10 3D Ultrasonic Wind Sensor now individually calibrated in wind tunnel. *** NEW 26 March 2014 Click here *** SBS-30 Second Battery Switch/Charger (Voltage Sensitive Relay). *** NEW 5 September 2013 Click here *** Customer installations photo gallery. See what others have done. *** NEW Click here *** WSD110 Digital/Analog Wind Speed/Direction and Air Temperature Display. 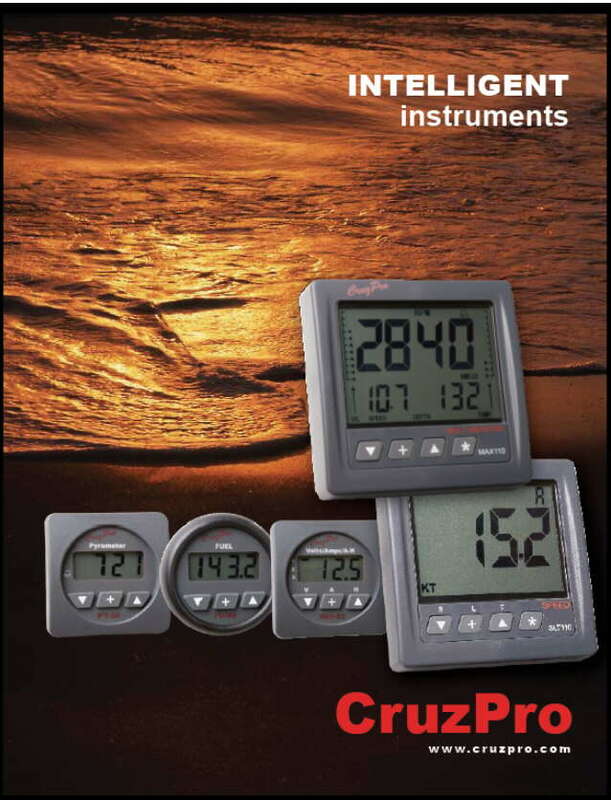 *** NEW Click here *** WTP110 Precision Sea Water Temperature Gauge Displays to 0.01 deg F/C. *** NEW Click here *** MaxRp110 software for Win98, WinXp, Win2K, Vista and Win7. *** NEW Click here *** PcFF80 PC Fishfinder Ver 3.15 software for Win98, WinXp, Win2K, Vista and Win7. *** NEW Click here *** CS60 Quad Clocked Switch - Switch four circuits under clock control. *** NEW Click here *** SOG1 GPS NMEA 0183 data to analog paddlewheel signal converter. *** NEW Click here *** Win98/XP/2K & Vista software to configure the RP30, RP60 and RP110. *** NEW Click here *** MaxRp110 Full Featured NMEA 0183 Data Repeater with Windows Software. *** NEW Click here *** MaxDS110 Ten Function Depth/Speed/Log Multi with NMEA 0183 output - check the specs and manual. *** NEW Click here *** EH55 Low Cost "No Frills" Digital Engine Hours Gauge. *** NEW Click here *** EH60 Full-Featured Digital Engine Hours Gauge. *** NEW Click here *** MaxVu110 Configurable Multi-Function Instrument - check the specs, Windows software and user manual. under control of a digital clock. required - no holes - no cleaning. Converter with built-in GPS Receiver and Antenna. and also has GPS NMEA 0183 Output. 9M (30 feet) of cable. 24 May 2017 - Update customer's "Installations Photo Gallery" page and USA dealer page. WSD110 Digital Wind Speed and Direction Display with NMEA 0183 input and NMEA 0183output. UWSD10 Ultrasonic Wind Speed and Direction Sensor with NMEA 0183 and RS422 output. WTP110 Precision Sea Water Temperature Gauge, Dytek, digital, 0.01 degree resolution.